4 x 12 Plastic Pop Up Register - White Discounts Apply ! Plastic registers are great for wet or damp spaces and are rustproof. The airflow deflector can be used to redirect air towards something or away from something. 4 x 12 Plastic registers can be used in the floor or wall mounted depending upon your needs. Airflow deflectors are a great way to direct air away from windows and back into the room. Plastic registers are made of a high gauge polystyrene and are sturdy enough to walk on. 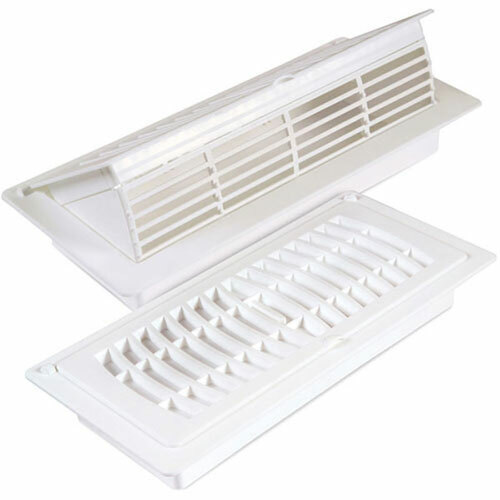 Use these airflow deflectors to save energy while increasing your level of comfort. ***Hint: The industry standard is to order using the actual floor hole size and not the faceplate cover size. Pop-Up registers will fit a 4 x 12 inch hole opening. Registers with an airflow deflector can also be purchased in a 4 x 10 size. An airflow deflector register is a great way to save money while improving your level of comfort, don't delay order today!